Find My Workspace lists over 95% of the business centres market in Oldham. Simply click Request Quote to check pricing for one office, or Add to Basket for multiple offices. 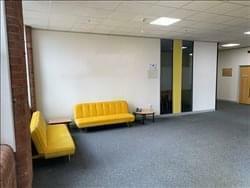 Based in Oldham and housed in a historic textile mill dating back to 1863, this centre has undergone a fantastic transformation and now offers first rate business space. The centre is composed of over 200,000sqft and is an exciting proposition whether you are a start-up looking for your first home, or a more established company looking for new surroundings. The centre benefits from full IT connectivity and ultra-fast fibre internet. All suites have lots of natural light and tenants will have 24 hour access. The centre also has a manned reception area and postal service, breakout space, kitchen facilities and meeting and conference rooms. Tenants also have the opportunity to have their space customised and bespoke to your brand. Offers serviced Office Accommodation and has a number of Suites currently available which would suit your needs. It prides itself on the adaptability of space and offers a bespoke service in terms of office design and layout when necessary. It can provide furniture and technology to suit your individual needs and have full Broadband, CAT 5 and Wireless connectivity in all offices. There is a multi-line phone system to ensure that when you need to make and receive calls lines are always available. As well as on site car parking, there is plenty of on street parking outside the Business Centre. For tenants that require meetings, conferences or training, we have two rooms available for use as and when required. There is currently a price match policy to ensure that they are as keenly priced as their competitors and are confident that they can provide a quote that fits within your budget.